Dr. William B. Moore of the Atmospheric and Planetary Science Department treated a crowd of about 30 students and parents to a presentation on the origin of the Moon at the Jones Middle School planetarium on November 13. 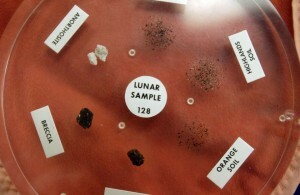 The attendees also got to check out actual Apollo program samples from the Moon and meteorites obtained from Johnson Space Center by Lawrence “Bird” Taylor of the Virginia Peninsula Astronomy Stargazers. Dr. Moore gave a “tour” of the samples and answered questions from the audience before the monthly (2nd Tuesday) planetarium show.